Thank you sponsors, runners and volunteers for being part of our 2016 Strong Kids Fun Run. With the help of our 195 run participants, generous sponsors and volunteers, an amazing $19,000 was raised for our Strong Kids Campaign – an increase of nearly 30% from 2015. This means over three hundred children and youth will now be able to access YMCA programs, services and camps who might otherwise have been excluded because of their financial situation. Results for the 2016 Race can be found here. A wonderful gallery of memories from the day can be found here. A list of our generous sponsors can also be found on the run site. Thank you for making YMCA Calgary a place for everyone to belong, grow, thrive and lead. We look forward to having you back to the 2017 Strong Kids Run on Saturday 6th May 2017. Our thoughts are with the communities affected by the wildfires in Northern Alberta. YMCA Calgary would like to extend an invitation to all of those evacuated from fire-affected areas to use any of our YMCA Calgary locations free of charge. Although we cannot accommodate overnight stays, we can offer the use of all facilities, including drop-in fitness and aquatic classes and shower facilities at all five of our Calgary locations. Facility locations, hours and schedules can be found on our website at http://www.ymcacalgary.org/programs-locations-and-membership/ or by downloading our free app available at the App store or on Google Play (search YMCA Calgary). Scotiabank gives $180,000 to build a much needed sport pad at the South Health Campus YMCA that will benefit Calgary’s children and youth. With your help, Scotiabank will give more! 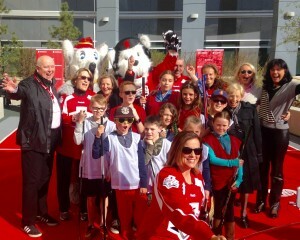 On April 11, 2016 hockey Olympians Cassie Campbell-Pascall and Kelly Bechard challenged YMCA youth in the inaugural hockey game on the new sport pad at South Health Campus YMCA. Scotiabank and Calgary Flames mascots were also there at game time. Scotiabank has partnered with YMCA Calgary to build a much-needed sport pad at the YMCA’s Alberta Health Services South Health Campus. The sport pad will provide an outdoor space for young people to stay healthy, develop physical literacy skills, enjoy the comradery of sport and learn essential life skill of teamwork. This donation will go to the Scotiabank Youth Leadership and Recreation Fund, which the YMCA will use to expand and develop child and youth programming and fund program participation through YMCA’s Strong Kids Campaign. Used for hockey, badminton, soccer, basketball and more, the sports pad will be shared by the South Health Campus YMCA, Alberta Health Services and Calgary Health Trust. All three organizations, and the work they do in the community, will benefit from the addition of the sports pad to the health facility. Scotiabank is generously pledging up to an additional $70,000, donating an extra $5 for every video share, favourite or retweet through their Facebook and Twitter accounts. Help raise more funds . Share, favourite and retweet today! Build your Health and Wellness Career here. Imagine spending your day evaluating and creating health and wellness programs, providing guidance and training, and creating meaningful relationships with a fun community. Imagine doing all this with an organization that offers multiple benefits, opportunities for advancement, and fun. Apply for YMCA Calgary’s Conditioning Centre Monitor and Wellness Coach position today! A summer afternoon lemonade and ice tea stand gives hope, health, and the power of potential to kids who benefit from the YMCA’s Strong Kids Campaign. Not your regular lemonade stand. Not your regular kids. 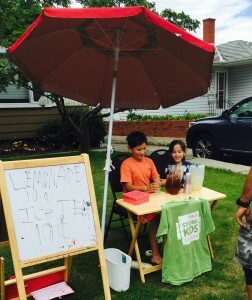 When Adam (Age 10) and Ashlyn (Age 7) stirred their lemonade and brewed their ice tea, they were preparing for more than a day at their stand, they were preparing kids for life. The YMCA’s Strong Kids Campaign raises funds for YMCA programs that give kids opportunities to reach their full potential: to live healthier, happier lives today and grow into more productive adults in the future, regardless of their background or financial situation. $10/month enables a family peace of mind as their child attends day camp in a fun, nurturing, and safe environment. $20/month supports a teen to participate in leadership development programs; building their skills, character and self esteem. Could Adam and Ashlyn’s Dad, Ken Lima-Coelho of YMCA Calgary, be any prouder? Thank you Lima-Coelho Family for helping raise strong kids. Every kid deserves a chance to reach their potential. Follow Adam and Ashlyn’s lead by fundraising or donating today and help us build happier kids and healthier communities. 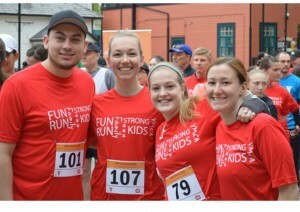 Visit www.ymcastrongkids.ca for details. Deceptively quiet, 10% of drownings in children happen while being observed by an adult. Drowning doesn’t look like the thrashing, yelling scene that most people think it does. In most cases, those who are drowning are physiologically unable to call out for help. Their mouths can’t reach the surface of the water to inhale or exhale – never mind yell for help. While their arms instinctively try to keep their body upright and above the surface, they are not able to perform voluntary movements like waving for help. In just 20 – 60 seconds, someone who is drowning will quietly struggle on the surface of the water until they become fully submersed. The second leading causes of death in children (just behind vehicle accidents), most drown within 25 yards of an adult.